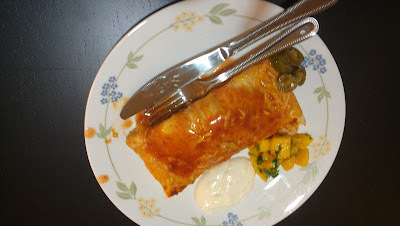 It is sometimes so easy to put together a wholesome dinner which has everything and just would not require one to be in the kitchen all the time either cooking or looking over something so that it does not get burnt......and one of the many easy dinner recipes is none other than enchilada!! I love to make these when I have less time on hand and also am in a mood to indulge myself in some extra carbs and cheese. I make different versions of enchilada like the one with chicken ,shrimp or just vegetables. In this recipe I have used only the beans and rice and no vegetables. Warm the left over rice.Mix it with taco seasoning and keep it aside. Place the corn tortillas on a flat surface .Adjust the filling for four enchiladas and keep it aside. First spread the beans, next the rice and then the cheese.Roll the tortilla and keep it aside.While you repeat it for other tortillas,preheat the oven to 375 degrees. Take a oven safe deep dish.Pour one can of Enchilada sauce in the deep dish and place the rolled filled tortillas with the closed side facing up.Pour the other can of sauce on top of the enchiladas and sprinkle the cheese equally on top of all the enchiladas. 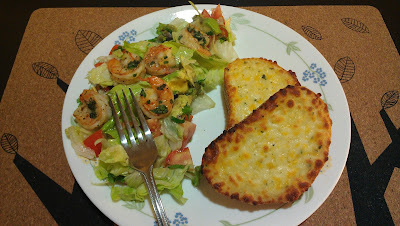 Place it in the oven for 10-15 mins or until the cheese is melted and the liquid in the dish is boiling on the sides. Mix all the ingredients and refrigerate until ready to eat. Serve the enchilada with sour cream, jalapenos and salsa on the side.